The Medieval Castle of Moha (château féodal de Moha in French) near Huy is possibly Belgium's oldest medieval fortress. Its origins are lost in legends. There are unclear mentions of a castle near Huy as early as 692. Late medieval texts refer to the place as Musal (in 1016 and 1212), Musau (1225 and 1237), Muhal (1297), then Mohal, Mouha, Mouhant ,... The original name was probably Mosheim (Mos- being the Meuse, from the Latin Mosa). The name Moha (formerly spelt Mouha) is also related to the Mehaigne River (Mouhagne in Walloon) that flows at the foot of the castle. The first reliable source comes in 1031, when we hear of a fief belonging to Albert, Count of Moha. Albert having no male heir, marries his daughter to Henry of Dasbourg from Lotharigia. In 1225, the castle passes to the prince-bishop of Liège due to the absence of heir. Otton de Warnant is mentioned as lord of Warnant and Moha in 1276. It is from this illustrious ancestor that descend the House of Oultremont (comtes d'Oultremont since the 18th century), one of Belgium most famous aristocratic families. The head of the family still lives in the 17th-century Château d'Oultremont in Warnant, a village a few kilometres north of Moha and Huy. Prince-bishop Adolph of La Marck reinforces the walls of Moha in 1315. In 1345 Englebert of La Mark is crowned prince-bishop of Liège at Moha Castle. 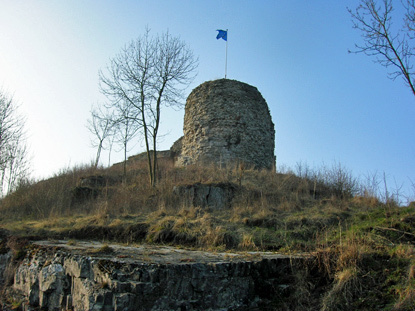 In 1376, the citizens of Huy revolt and take the castle. It subsequently served as a mere storage place for ammunition and was finally deserted in the 17th century. Moha progressively fell into ruins, and stones from the castle came to be used by locals to build their houses. In 1890, Gérard de Looz ask the Belgian State to purchase the ruins to preserved them from further decay. It became a National Heritage site in 1981. The castle of Moha is open from April to September. It holds sound and light spectacles the Thursday, Friday and Saturday of the Ascension. During that time medieval clothes can also be rented for more authenticity. There are numerous other events, such as archeology courses (in French, 10-14 July) and or a medieval fair (2 July). Moha is located 5 km north-west of Huy, between exit 7 and 8 on the E42 motorway.